1 image. Coast Guard rescue of boat, 31 July 1960. Disabled 42-foot cabin cruiser "Harry Ell". Caption slip reads: "Photographer: Emery. Date: 1960-07-31. Assignment: Coast Guard rescue of boat. Telephotos: Coast Guard cutter No. 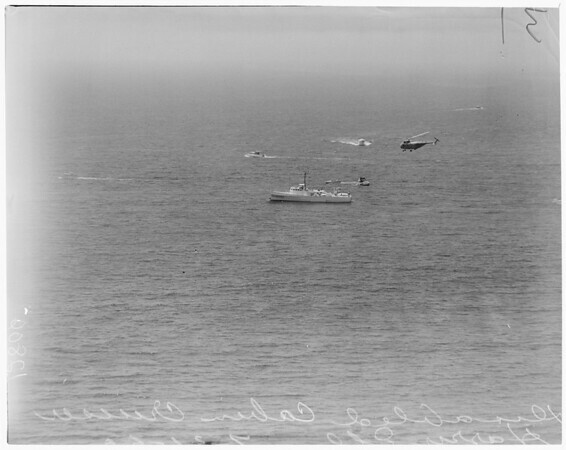 83450 aiding disabled 42-ft. cabin cruiser Harry Ell 500 yards off Point Fermin beach. CG helicopter hovering, carried tow line to disabled boat from CG cutter. Other vessels in pix standing by to help, etc., etc."